Dogs are creatures of routine. That’s over simplifying it, but the general idea is the sooner and the more frequently you enable your newly acquired pup to associate positive experiences with new things, the easier it is for the pup to accept new things down the road. Once your pup arrives, I have no doubt you will work on house breaking. I also hope you will make time for socialization and bite inhibition. I want you to think about that teenage nephew of yours, the one who gets straight A’s but has a “Do Not Enter” sign on his bedroom door, listens to emo rock and refuses to maintain eye contact. He used to play nice with his cousins when they were little. When did he become such a punk? A JA puppy transitions from toddler to teenager between 8-week-old to 5-month-old. Most healthy puppies can follow a generic, one-size-fits-all approach to socialization and bite inhibition described in this blog. However, if the owner chooses to focus only on house breaking during the puppy’s first few months in the new home, there will be consequences down the road. The remediation of said consequences will vary by the degree of deficiency, and may require professional interference. From my first hand experience, it is possible to live with a dog that does not like other dogs. But it is potentially dangerous to live with a JA that does not like people, making it difficult to administer basic veterinary care and grooming needs. Please make time to socialize your JA puppy, at the very least to allow for medical and hygienic purposes. As a rule of thumb, your pup needs to meet at least a hundred different people before he is three months old—an average of three unfamiliar people a day. In any of the situations above, if the pup is receptive to being handled or interacting with others, encourage him with verbal praises and/or food treats. However, observe the humans carefully that they are not behaving in ways that stress out the pup. Be on the lookout for people who do annoying things then complain that your pup is behaving poorly. For example, too often people lean over in front of the pup and rub the pup’s head. The pup might rear up to lick or mouth, and then the stranger exclaims your pup is mouthy. Worse, the pup could growl and bite. 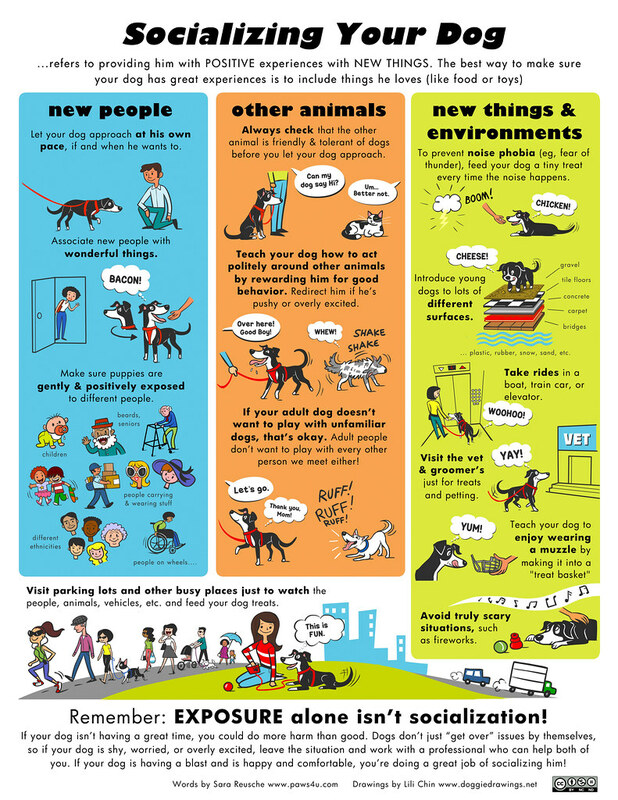 Lili Chin has a brilliant info graphic that illustrates How Not To Greet A Dog. I make it very clear to strangers that my pups do not enjoy having their heads touched and ask that they let my pup approach them before they attempt to stroke the pup’s cheeks or back. Alternatively, you can pre-emptively put a search-and-rescue style harness on your pup with large badges reading either “Please Ask to Pet” or “In Training,” and instruct others how best to approach your pup. You can purchase such a harnesses from the Active Dogs website. Shortly before our JA pup received her rabies shot, we learned the Episcopal Church in Saratoga holds a Blessing of the Animals Service the first Sunday of each October, as many other churches do in honor of St. Francis of Assisi. We took her in to get blessed. Luckily she was small enough for me to hand carry her the whole time. She got to meet lots of people of all ages, see other dogs, cats, pet birds, even draft horses! Socialization is a lifelong endeavor. Whatever you can do to maximize your pup’s exposure to new people, new places and new things in the first six months of his life, and make it a positive experience, will greatly influence his attitude and reaction to novelty later in life.